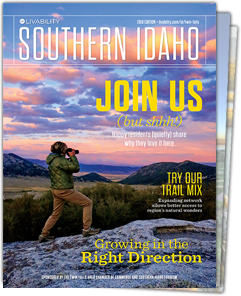 Southern Idaho is home to reservoirs, river stretches, and mountains that are ideal locations for hunting and fishing excursions — just ask the thousands of anglers and hunters who flock to this area every year. Don’t forget to get the proper permits and tags from the Idaho Department of Fish and Game before setting out. Magic Reservoir – This reservoir on the Big Wood River is a popular spot for boaters and anglers. It has great shoreline access, making it an ideal choice for young anglers. Drop a line here for brown trout, rainbow trout, smallmouth bass, and yellow perch. Lower Goose Creek (Oakley) Reservoir – Located near Oakley, this large reservoir is a good spot for catching walleye (good eating! ), trout, and perch. The reservoir was stocked with more than 300,000 walleye in June of 2017. Cedar Creek (Roseworth) Reservoir – This reservoir in Twin Falls County sits at 5,226 feet and is a high-desert gem for trout fishing. You’ll find two boat ramps here, one for high water and one for low water, but no campgrounds are available. Lake Walcott and Minidoka National Wildlife Refuge – Lake Walcott State Park, northeast of Rupert, is a hidden treasure that’s chock full of outdoor amenities. The park is situated next to Minidoka Dam on the Snake River. The dam, one of many built in Southern Idaho to bring the desert into bloom, creates 17-mile-long Lake Walcott, a popular spot for fishing and recreation. Minidoka National Wildlife Refuge – rings the shoreline of the lake and protects the islands for nesting waterfowl, including hundreds of white pelicans in the spring. The leafy state park is the primary place for launching a boat on Lake Walcott. On any given day, you might find people water skiing, jet skiing, stand up paddle-boarding, and often, sailing. It’s also a great place to catch big small-mouth bass and rainbow trout. On days with little or no wind, the lake would be fun for kayaking or canoeing. Salmon Falls Creek Reservoir – Salmon Falls Creek Reservoir is a 14-mile long reservoir that provides opportunities to catch nine species of game fish. It is the premier walleye fishery in Idaho, and trophy catches are a common occurrence. The reservoir has five recreation sites that provide primitive camping facilities, and one fully developed site at Salmon Dam that has designated camping units, picnic sites, recreational vehicle dump station and a boat ramp. Milner Historic Recreation Area – Milner Dam is one of the earliest on the Snake River and made farming possible in the high desert around Twin Falls and Burley. Hagerman Wildlife Management Area – It’s rare to go home empty handed after fishing at the Hagerman Wildlife Management Area near Hagerman. There are multiple ponds to fish for rainbow trout, bass, and bluegill. It’s a kid-friendly and family-friendly fishing location with easy dock access for young kids, disabled folks, or senior citizens. In the past several years, Idaho Fish and Game has added several new fishing docks to make access even easier. Public restrooms are available. Bell Rapids – This is a popular place to stop for a picnic while exploring the Hagerman Valley or fishing the Snake River at Bell Rapids, which can be good for trout fishing. Fly fishermen usually use leech or nymph patterns for trout, but you can also fish with a bobber and worm and hook a few bluegills. The Hagerman Valley stretch of the Snake River is a popular day trip for float boaters. Dierkes Lake – Located next to Shoshone Falls, the lake is a good place to fish for bass, bluegill and trout. Thousands of kids have caught their first fish at Dierkes Lake because of the great access next to the spring-fed pond. There is a walking/biking trail around the lake as well. Lower Malad River – Try fishing this stretch of river below Malad Gorge State Park for trout. Trout here respond well to either flies or lures. Lake Cleveland/Independence Lakes – While camping at Lake Cleveland, south of Albion, you can fish for trout at this beautiful high-elevation location. A two-mile hike will take you to the Independence Lakes, where you can catch trout and grayling. These high mountain lakes are a bit remote; they can be found 8,300 feet above sea level and are great to visit during the hot summer months. Wilson Lake Reservoir is a prime fishing spot: A record perch was caught here in 1976. Thanks to grants from the Idaho Department of Parks and Recreation, this area was recently improved so it will be accessible for generations to come. The property includes a five-acre park, sandy beaches, boat docks, and plenty of places to picnic. Take your pick from one of 40 campsites in the area and enjoy the quiet. Lake Murtaugh – This popular low-elevation camping spot is near the town of Murtaugh. The irrigation reservoir is an excellent destination for boating, fishing, and maybe swimming (after it gets hot — water is cold!). The recreation site is managed by Twin Falls County. Niagara Springs Wildlife Management Area – This area is known for its pheasant hunting and for the year-round fishing at Crystal Springs Lake in the canyon. The fishing at Crystal Springs Lake is handicapped accessible. The Niagara Springs WMA is a great place to hunt waterfowl or see abundant wildlife. Western Spirit Ranches – Bird hunters can get a lot of hunting action at Western Spirit Ranches in Shoshone, a private bird-hunting ranch. They have hundreds of acres of private land, and lots of pheasants that are planted in advance of a private hunt. There are some chukars that may flush out of the brush as well. The ranch is open from Aug. 15-April 15 each year. South Hills Unit 54 – Mule deer and white-tailed deer abound in Unit 54, an area that encompasses more than 900 square miles of ground in the South Hills. You’ll also find great elk hunting, and elusive moose and pronghorn antelope — even mountain lions during their late-winter season. Albion Mountains – This region is famous for its deer hunting — thousands of mule deer migrate through the area. But it’s also great for upland bird hunting, small game like rabbits and hare, and big game like elk, moose, bighorn sheep, and even wolves.